– Greta Thunberg, a 16-year-old Swedish climate activist, who helped kick off a recent wave of protest across the world against inaction on climate change. Hope without action on climate change is as meaningless as “thoughts and prayers” after a mass shooting. The Intergovernmental Panel on Climate Change (IPCC) issued a Special Report in October 2018 warning that by 2050, without major course correction, over 350 million more people globally will be exposed to deadly levels of heat stress; in the U.S., wildfires in the West will burn at least twice as much forest area than in the years preceding 2019; and there could be as much as $1 trillion in damage to public infrastructure and coastal real estate. As of 2014, the U.S. was responsible for 20 percent of all global greenhouse gas emissions. For decades, it was considered radical to even accept that climate change is real. Now, there is widespread acceptance of the reality of climate change, but in the face of the political establishment’s infuriating inaction, what’s considered radical is actually proposing to address the large-scale problem with an appropriately sized solution. This gap between the scale of the problems we face and the solutions being put forward by establishment politicians can be seen on issue after issue – whether it be obscene economic inequality, systemic racism and sexism, or the imminent climate crisis. This is a central driving force behind the politicization and radicalization among ordinary people currently taking place across the world. It is in this context that the Green New Deal being proposed by Alexandria Ocasio-Cortez, self-described democratic socialist Congressperson from New York City, is gaining mass support across the country and setting the terms of the debate around what kind of action is needed to combat climate change. As proposed by Ocasio-Cortez the Green New Deal is a resolution, not a bill, which means it’s not binding. If passed, it sets priorities that Congress is supposed to take up by subsequently passing actual laws and policies. The Green New Deal calls for meeting 100% of the power demand in the U.S. through clean, renewable, and zero-emission energy sources. Although most media outlets have reported that the Green New Deal calls for 100% renewable energy by 2030, the resolution itself actually doesn’t specify a year. It calls for overhauling transportation in the U.S. to become climate-friendly. It also calls for upgrading “all existing buildings in the United States and building new buildings” to achieve maximum energy efficiency, and for the international exchange of technology, expertise, products, and funding to help other countries achieve a Green New Deal as well. The resolution is presented as a far-reaching anti-poverty program with strong language against economic and social inequality. It calls for the creation of millions of “high-quality union jobs that pay prevailing wages, hir[ing] local workers, offer[ing] training and advancement opportunities, and guarantee[ing] wage and benefit parity for workers affected by the transition.” It also calls for a democratic and participatory process that includes workers and oppressed communities in planning, implementing, and administering the Green New Deal at the local level although it is not spelled out how this would be done in practice. Going beyond just the environment, the Green New Deal calls for all people in the United States to be guaranteed a job with a family-sustaining wage, adequate family and medical leave, paid vacations, and retirement security. It also calls for stopping the United States’ “historic oppression” of women, people of color, and immigrants. The resolution concludes by calling on the federal government to guarantee all people high-quality health care, affordable housing, and overall economic security. Despite being the richest country in the history of the world, not a single one of these basic needs are guarantees for an ordinary person living in the U.S. We are told it would cost too much to meet everybody’s fundamental needs and transition to 100% renewable energy. Meanwhile the three richest men in America are hoarding as much wealth as is held by the bottom half of the population. 100 corporations globally are responsible for over 70% of the world’s greenhouse gas emissions since 1988. The truth is that our civilization and the planet are being sacrificed so that a handful of people can continue making massive amounts of money. The Green New Deal seeks to turn this around. The 2018 IPCC Report estimates it would cost $900 billion per year to implement the program it says is needed. The Green New Deal is modeled on their proposals. Ocasio-Cortez proposes this should be paid for in part with a 70% marginal tax rate on all income over $10 million. This would be a good start but not enough to fund the entire program. Additional funding could come from taxes on the major fossil fuel corporations, big banks, and financial institutions. However, these corporations are not leaping at the opportunity to be taxed billions of dollars to address climate change. 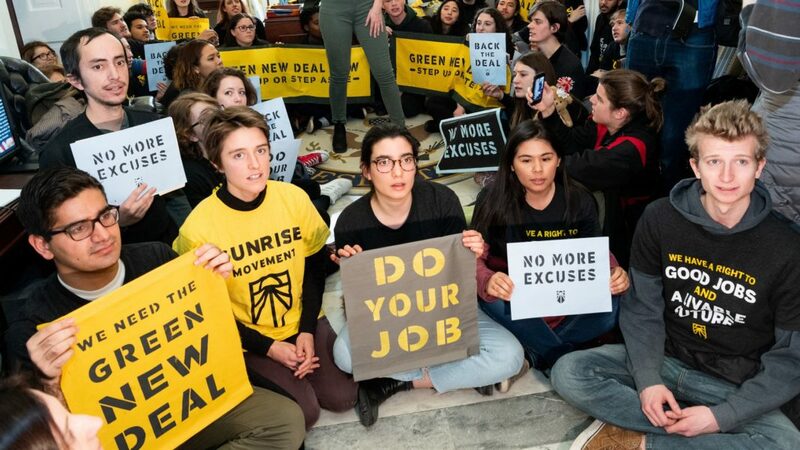 They are prepared to mount enormous opposition to the Green New Deal, and this opposition will become increasingly visible as the movement in support of it grows. Now, three years after Sanders popularized Medicare for All, a majority of Americans support it, including a majority of Republicans. Longtime establishment and corporate-friendly Democrats such as Corey Booker or Kamala Harris now feel forced to give verbal support of such policies in order to even be considered by most Democratic voters. This could become the case with the Green New Deal as well. We must be careful though. There is a massive difference between offering verbal support for the Green New Deal during a political campaign, and supporting the concrete measures required to achieve it, not to mention building the movement that will be necessary to win it. Public statements are one thing, but behind the scenes lobbyists and powerful corporate interests exert pressure and even give directives on what the politicians they fund can and cannot do. Uniting all who want to stop the looming catastrophe requires a clear, bold set of demands. It also requires a clear understanding of how major progressive change is won. The only force capable of counteracting entrenched corporate opposition is a mass movement centered on the social and economic power of the working class. There is an element of fear-mongering here that must be challenged. The real threat to union members’ and all workers is not the Green New Deal. It’s the manufacturing, construction, and energy sector bosses as well as the corporate establishment of both political parties, who are allowing the status quo of low wages, worsening benefits, and rising cost of living to continue, not to mention the coming disastrous effects of climate change itself. In fact, the resolution itself calls for “high-quality union jobs…, training and advancement opportunities, and guarantees wage and benefit parity for workers affected by the transition.” This could benefit from more specificity but to label this an attack on jobs and working families’ standard of living is simply untrue. Mistakenly, environmental movement has frequently taken an approach dismissive of the legitimate concerns of workers about their jobs and living standards. Ocasio should take up their offer for further dialogue and publicly challenge these labor leaders to come to the table to discuss a united proposal that all workers and environmentalists could get behind. There are unions nationally which are in favor of strong action on climate change such as Amalgamated Transit Union, Communication Workers of America, and National Nurses United, as well as locals of many other unions, including in the building trades. These unions should actively mobilize support for a workers’ Green New Deal and show an alternative to the conservative leadership which currently dominates most unions. It is the fossil fuel bosses who must be left in the dust, not the workers who have a key strategic role in fighting for this industrial transition. Winning a workers’ Green New Deal will require the movement, including labor, not mistaking the corporate leaderships of the Democrats or Republicans as their allies, and instead mobilizing its full power with mass protests, industrial actions, and strikes. The reason we are in this position in the first place is that we live in a society where political and economic decisions are dictated by the profit of privately-owned companies. Since serious action would require directly attacking the interests of large sections of corporate America, the political establishment opposes any comprehensive proposal to move rapidly to 100% renewable energy. Even under capitalism, if a sufficiently strong mass movement is built, some aspects of the Green New Deal could be won. But to achieve a full transition to an economy based on renewable energy by 2030 will require taking unprecedented steps against the private ownership of key sectors of the economy. Unfortunately, neither Ocasio-Cortez nor Sanders accept that we would have to move beyond the framework of capitalism to achieve these goals, which is a fundamental weakness of their approach. As long as the main energy companies are privately owned and run on the basis of profit and competition, they will fight against the Green New Deal and the scale of the funding, planning, and cooperation needed for the full plan simply cannot be achieved. We will need to take the main fossil fuel companies into public ownership, under the democratic control of working people, to actually carry out such a far-reaching plan, especially in such a short amount of time. The transition will have to include a complete infrastructure overhaul, requiring taking key sections of the manufacturing and construction industries into public ownership as well. On the basis of a democratically agreed upon plan, public transportation could be massively expanded. New high-speed railways and trains could be built, and the auto industry could finally divorce itself from big oil and rapidly transition to producing electric vehicles only. Road and highway infrastructure would need to be updated to coincide with this change. As mentioned above, a plan of this scale would cost approximately $900 billion annually, a huge number. But the resources already exist for an initiative on this scale. Collectively, just the top fifteen banks in the U.S. own $13.5 trillion. They will never give up this money for the common good voluntarily, so taking the big banks and major financial institutions into public ownership is also a necessary part of this transition. Given that the billionaire class will fiercely oppose removing these key industries from private ownership, it will only happen as the result of a united mass working-class movement fighting consciously to do so. A vital tool for this struggle is building a new working class party with a clear socialist program. We completely agree with the broader goals of the Green New Deal to end poverty and oppression but these too cannot be achieved within the framework of this system and will require revolutionary change. Taking the main pillars of the economy into public ownership to establish a democratically planned economy based around human need would lay the basis for the development of an egalitarian socialist society, under which exploitation and all forms of oppression could be rooted out. With the escalation of the international climate crisis, the need for humanity to move beyond capitalism to socialism has never been posed more sharply. Join Socialist Alternative to help us fight for a workers’ Green New Deal and socialism.